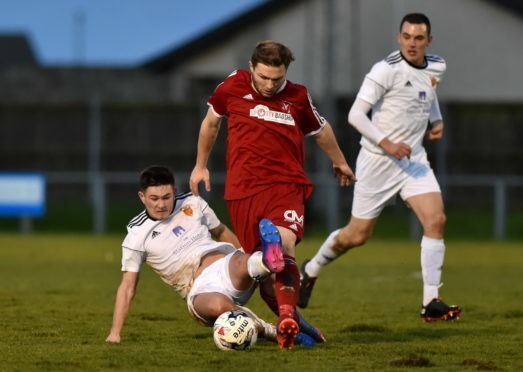 Dane Ballard (red) in action for Deveronvale against Rothes in the Highland League The Press & Journal Scottish Highland League. Deveronvale (red) v Rothes (white) at Princess Royal Park, Banff. Picture of Stephen Rennie (white) sliding in on Dane Ballard (red). Dane Ballard was playing for Deveronvale FC last September when his studs got caught in the pitch at Rothes’ Mackessack Park and his leg twisted, leaving him with a nasty knee injury. It took four months for the prison officer to be diagnosed with a ligament rupture and grade 3 tear of the lateral meniscus. It is now feared that he may have to wait longer than a year for surgery on the NHS due to long waiting lists. However, the club has now stepped in and launched a fundraiser to help the 26-year-old get the treatment he needs. Deveronvale FC director Neil Montgomery said the semi-professional team was keen for the footballer to fully recover. Mr Montgomery said: “If this was going to take 18 months or longer on the NHS it might be that his career is over. “We want to find funding to give him the opportunity to play football again because he is in his late 20s and hopefully the operation would be successful. “He is an important player for us and gave us 25 goals last season. He was at Rangers when he was younger so he has a very good pedigree. The Highland League star has been out of action for 164 days since suffering the serious knee injury. To pay for Mr Ballard to have an operation at a private hospital and rehabilitation the club will need to raise £7,500. It’s hoped the money raised will help him return to play for the club as soon as he is fit enough and improve his ability to work in his self-employed role. Mr Montgomery added: “We are a family club and we want to make sure our best players are looked after.